Shiny silver chain bracelet (or anklet) with several bezel links, each with a rainbow colored, iridescent cab with a fish scale texture in it. Touchstone Crystal by Swarovski, Pacific Opal and Montana Ice Bracelets 7.25 in and Montage Necklace, adjustable 16-19in. Rhodium Plated Silver. Sold as Set Only. In excellent preloved condition. Please see my feedback and my other great items for sale. With Adorable Starfish Charm. Stretch Tennis Bracelet. Made with Brilliant Sparkling Swarovski Crystals. Bracelet has a Hidden Stretch Band. OSFM ~ One Size Fits Most. Abalone puau shell inlay sterling silver bracelet, 15/8" wide, 7.5-8" length, toggle closure, weighs 11.72g., very good condition. MONTANA BLUE SILVER ANCHOR / SHELL CHARM BRACELET. 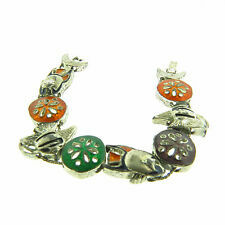 This very cute Seashell charm bracelet can be worn as an anklet as well. Main Stone Acrylic. Main Color Silver. Style Tennis. Style Chain. 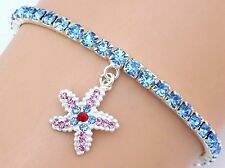 This very cute Starfish bracelet can be worn as an anklet as well. 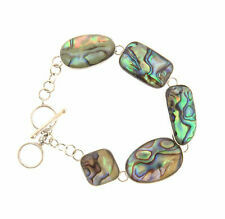 YOU ARE VIEWING A SILVER TONE MULTICOLORED ABALONE PAUA SHELL LINK BRACELET. THIS ONE MEASURES 7 1/2" LONG AND STILL LOOKS INCREDIBLE!! I'LL SHIP THIS OUT WITHIN 24 HOURS OF PAYMENT!! ANY QUESTIONS JUST MESSAGE ME. THANKS FOR LOOKING AND BEST OF LUCK! !